RAK #90 – earlier this week, I took a friend out to lunch.Â It was fun, and we enjoyed some great conversation. Next time you go out with a pal, instead of splitting the bill, just pay for it.Â It’s a small price to pay for friendship, and a nice way to brighten someone’s day. Most people donâ€™t mind being interrupted by a man delivering flowers, and Gina De Luca, music office secretary at Napa High School, was no exception. 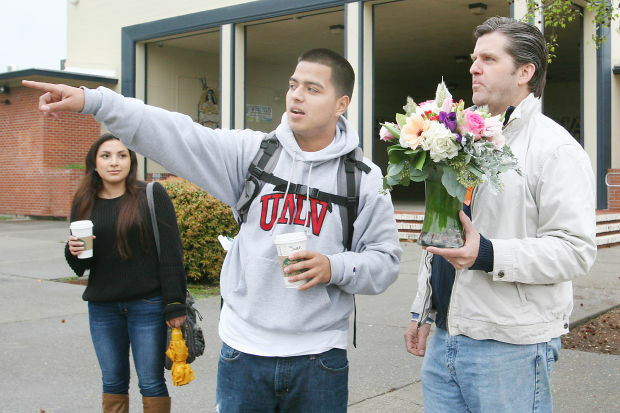 On Wednesday morning, John Prittie, owner of Beau Fleurs Flower Company in Napa, surprised De Luca in a classroom near the schoolâ€™s theater with a colorful spring blossom bouquet. Prittie calls his deliveries â€œrandom acts of flowers,â€ a takeoff on the â€œrandom acts of kindnessâ€ movement. The florist created the campaign in part to celebrate the 20th anniversary of the family-owned business, he said. The idea is to recognize someone who deserves a free bouquet of flowers, Prittie explained. That could mean someone who helps others â€” perhaps someone behind the scenes who might not always get the recognition he or she deserves. Or someone who faces adversity or assists those who do. Anyone can receive a random act of flowers, Prittie said. Locals can drop by the shop to submit a name. Once a week, Prittie will pull a name from the nominations and deliver a free arrangement. â€œI thought it would be fun if we could launch something involving the community that would be fun to do and spread good cheer,â€ Prittie said. RAK #89 – earlier last week, I let someone go ahead of me in line at the grocery store.Â They actually had more items than me, but I just thought it would be a nice gesture. RAK #88 – this one actually occurred a couple weeks ago, but totally forgot about it until now. This RAK was simple, but valuable.Â I spent time with an old friend, having lunch and catching up on life.Â It had been a few months since we had connected, but sometimes it’s nice to slow down and take a few minutes to focus on what’s important. And by “important”, I mean baseball, beer, and Anchorman quotes. RAK #86 – my family needed to pick up some items from two different stores, but no one was feeling up to going out, especially since it was after 9pm.Â Feeling tired myself, I really didn’t want to run the errand…but that’s the whole point of the RAKproject – doing something nice for others.Â OK, so it wasn’t random, and you could argue that family responsibilities don’t count…but it’s my project and I’m countin’ it! So I went to both stores and it only took about an hour, and my family was appreciative.Â Totally worth it. ARLINGTON, Mass. — An army girlfriend has been overwhelmed by the kindness of a stranger after a random act of appreciation. 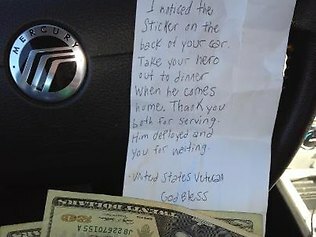 An anonymous do-gooder left a kind note and $40 on the windshield of a servicemanâ€™s loved one in a Dunkin’ Donuts parking lot on Sunday. Samantha Ford emerged from the donut store to find a hand-written note on the back of a white envelope with two $20 bills inside. Overwhelmed with emotion, sheÂ shared the gesture on Facebook. “I just thought I would share with you all what happened to me today!” she wrote.Â “Came out of Dunkin Donuts and found this under my windshield wiper. “There are no words to describe how I’m feeling right now. Tears in my eyes.Â I just wish I could thank whoever did this! RAK #83 – another fun Colorado snowstorm that dropped a foot of snow, which in turn created 18″ drifts…and what’s more fun than shoveling snow in bone-chilling wind?Â While outside clearing off the driveway and sidewalk, I decided to just do a little more work and shovel the whole sidewalk for my next-door neighbor.Â A small effort, but a huge Act of Kindness.